Eating in the summer is so much fun! Colors are abundant and, though our tomatoes had a tough time (not a one in the garden, folks), we have enough mint for the neighborhood, a garden filled with chard, kale, and a giant zucchini that went from small to giant in a few days. It is easy to eat fresh food and to make a simple and satisfying meal this time of the year. Still, as a mom who likes enjoying and tasting my food during a meal, making something that makes everyone happy is sometimes difficult. I need a no-nonsense, sure-to-avoid-excessive-whining, everyone-leaves-dinner-satisfied meal from time to time. Anyone else? Enter make your own tacos or nachos night. Bless. The basic plan? Chop up fresh everythings and put them in individual bowls. Kids don’t like something? They just don’t put it on their meal creation. Everyone stays happy. It’s like an art class where you get to pick our your favorite colors to use on your canvas. It’s your canvas. Do your thing. 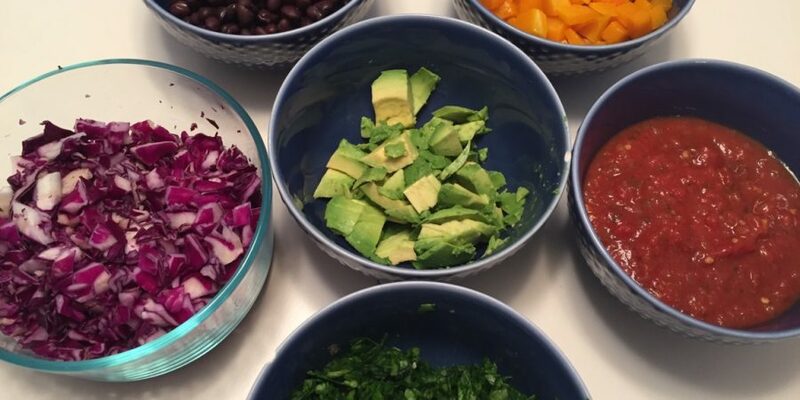 Buy your favorite wraps or basic chips (we all love blue corn chips in our house), but also know that anyone who wants to can also make a decent salad from the following options. Genius. Then put a spoon in each of those bowls, put a plate in front of everyone circled around the table and go to town making your individual creations. My special secret? Get a bit of plain Greek yogurt, squeeze in the juice of one lime, and just a splash of maple syrup and stir it to create a beautiful sauce as an option to drizzle over all of the goodness. Taste to your liking. Maybe your youngest daughter decides that her beautiful plate of nachos needs an extra dousing of maple syrup. It’s all good. Everyone has their own creation and enjoys their dinner. You actually taste and enjoy yours…a certified miracle in the middle of the week. It might be such a great meal option that you change it up just a bit (or not) and repeat the same thing again for another dinner the same week. 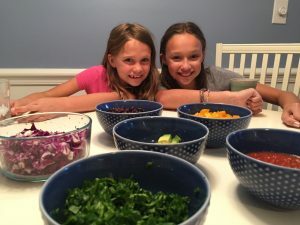 Because, bless the color, bless the freedom for everyone to be able to make a simple meal they like with no complaining, bless summer, bless bowls of fresh ingredients, bless the easy clean up, and bless the people you love around the table. Make taco or nacho night a part of your week, friends. Trust me on the sauce.